Oral cancer is frequently diagnosed at a late stage, and the outlook for complete recovery and survival is not very optimistic. However, if diagnosed early, the five-year survival for oral cancer is 75 percent versus only 20 percent for patients with late-stage diagnosis, as stated by the U.S. Department of Health and Human Services. Improvements in treatment options for late-stage patients require extensive preclinical studies that involve human tumor xenograft models. The SAS cell line was isolated from a poorly differentiated squamous cell carcinoma of the tongue. A 2013 study by Li et al. published in International Journal of Oncology examined the antitumor effects of the scutellarin on human tongue squamous carcinoma (SAS) cell line in vitro and in vivo using the SAS xenograft model. Findings reported that the scutellarin treatment significantly inhibits the growth of xenograft SAS tumors in immunodeficient mice and regulates inhibition of tumor cell proliferation, induces apoptosis and mediates expression of MMP-2, MMP-9, and integrin αvβ6 at the mRNA and protein levels in vivo. The article demonstrats the anti-tumor therapeutic effect of scutellarin by inhibition of the ability of SAS cells to metastasize. In 2015 Huang et al. published an article in BMC Cancer investigating the mechanism of honokiol, an active compound found in Magnolia officinalis, effects on eliminating cancer stem cells (CSCs) in oral cancer. Using the SAS cell model and the side population (SP) technique, results showed that hokinol treatment suppressed sphere formation in culture and xenograft growth in vivo. It was also demonstrated that hokinol treatment led to apoptosis induction and JAK2/STAT3 signaling inhibition, supporting CSC targeting for treating oral cancer. Lastly, a 2012 Integrative Cancer Therapy study (Lu et al.) used SAS cells in vitro and xenograft model to characterize the mechanism of gypenosides (Gyp), active compounds in Gynostemma pentaphyllum Makino, on tumors. Data showed that Gyp treatment caused morphological changes, cytotoxicity, cell cycle arrest, apoptosis induction (both caspase dependent and caspase independent), mitochondrial disrepair and inhibition of tumor growth in a nu/nu mouse xenograft. These results support the potential of gypenosides as anticancer agents. The SAS cell line (human tongue) is used to create the CDX (Cell Line Derived Xenograft) SAS xenograft mouse model. 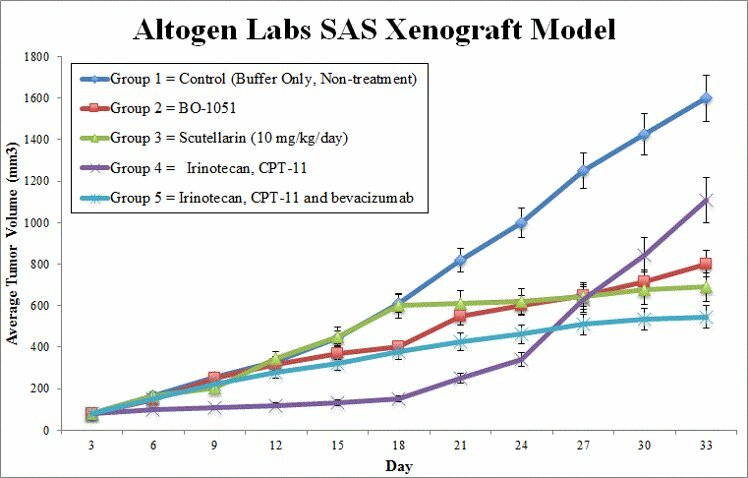 The SAS xenograft model exhibits anti-tumor activity after treatment with platinum-based chemotherapeutic agents, taxanes and valproic acid. All flasks containing cells are maintained at a confluency allowing exponential growth. After trypsinization, cell viability and concentration are determined by trypan blue. Density is adjusted such that inoculations are 1 x 106 cells in a 100 µL suspension (Matrigel + SAS). Subcutaneous (s.c.), injections are performed into the hind leg of athymic BALB/C or NOD/SCID mice (10 to 12 weeks old). Treatment cohorts are formed after randomization of mice, which marks the beginning of the study. All test materials are injected following the client supplied dosage concentrations and schedules. All tumor measurements are logged (daily measurements), including mouse body weights (tri-weekly). The end of the study is reached at the tumor size limits (or 2,000 mm3), and necropsies are performed. Customer instructions determine the specific tissues to be collected and the method of storage (RNAlater, frozen, 10% NBF, etc). Tumors are weighed; optional digital imaging is available upon request.